I've been struck down with a nasty virus (is there any other sort? ), and it's unfortunately effecting my eyes (among other parts!). So this is something of a make weight. 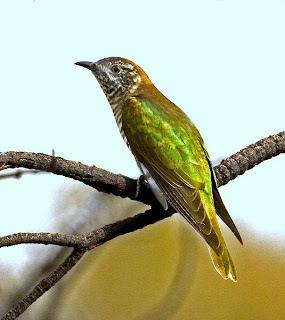 Shortly after taking the shots of a Shining Bronze-Cuckoo in the previous blog, I visited Risdon Brook Park, near Risdon Vale. I had photographed Horsfield's Bronze-Cuckoo there a few years ago--pretty awful shots in fact--and I had seen a single individual on a recent visit, so I was hoping for a another photo opp.. Arriving early am, on a very still and overcast morning, I'd hardly got out of the car when I heard my first cuckoo, a Pallid, calling from the nearby high ground. A good omen I thought. Well in the few minutes that it took me to get my gear organised and cross the car park, I'd heard, in quick succession, a Fan-tailed Cuckoo, and both Horsfield's and Shining Bronze-Cuckoos. What more could I ask for? Now all I had to do was find them. Cuckoos have, from my observations, very large territories, measured in hectares, and I haven't found chasing after calling birds particularly productive. So I set off birdwatching, hoping that sooner or later, I might just be lucky. I did get some good birding in, including seeing both Blue-winged and Swift Parrots, and my first Beautiful Firetail in this venue for a couple of years. A fairly distant view of a Brown Goshawk being harassed by a pair of Yellow Wattlebirds, high in a eucalypt. One of the many Kookaburras in this park , being mobbed by some recently arrived Dusky Woodswallows. But although I heard several cuckoos, I didn't look in any danger of photographing one. But that's the way birding is, and makes the good days really stand out. After about 3 hours of tramping around, I headed back to the car, having taken few shots, save for some close ups of the few orchids that have survived, despite the dry conditions. Crossing a large open area of what was once a sheep run, I stopped to watch some Dusky Woodswallows hawking for insects from the dead branches of a fallen wattle. I closed on them to get a few shots, and disturbed a perched Pallid Cuckoo which 'looped' its way to the top of fairly distant gum. Decision time. Was I going to try to take some shots that I knew would hardly amount to much anyway? I was pretty weary by now and lunch was beckoning. While I was still deliberating, I saw a bird fly to the ground some hundred metres away, and was now mostly hidden in the dry grass. A look through the binos established that it was a Fan-tailed Cuckoo, the first that I'd seen that morning, despite hearing several. Well, as you can see by the accompanying images, I scrambled a few shots of this surprisingly tame individual. 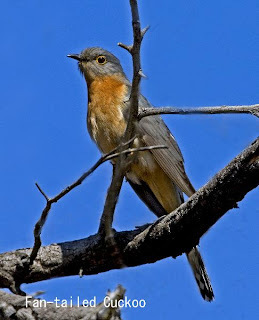 The Fan-tailed Cuckoo is arguably the most commonly seen cuckoo in Tasmania. 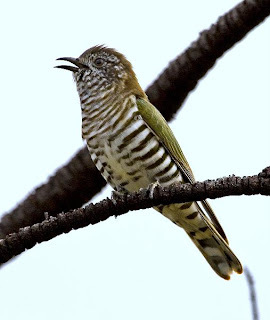 All our cuckoos are Summer migrants, but Fan-tailed Cuckoos commonly overwinter, usually in coastal areas, and I recorded 2 calling vigorously on Goat Bluff, South Arm, in the middle of July this past Winter. I would like to have recounted how, after diligently searching for a Shining Bronze-Cuckoo, I finally tracked it down and photographed it. But the truth is that luck played a major part. Earlier this week, on a less than perfect day for photography, I decided to spend a few hours birding the nearby 'nature recreation reserve' at Rosny Hill. For most locals (including me), this reserve is the scenic lookout, giving expansive views over Hobart City, the western suburbs, and the Derwent River estuary. It's not an area that readily springs to mind when looking for a place to bird, but, as I was about to find out, it has hidden depths. This reserve of around 26 hectares, consists largely of casuarinas and wattles, with a few taller eucalypts, and is subject to frequent controlled (and uncontrolled) burns. Apart from about a hectare around the lookout, much of it is reasonably steep hillside. A quick walk around the parking area, found a single Black-faced Cuckoo-shrike, and a passing flock of 4 or 5 Dusky Woodswallows, the first that I had seen this Spring. Several Tree Martins, and a single Welcome Swallow were hawking nearby, joined occasionally in the updra ught, by the resident pair of Forest Ravens. A flock of 30 or so Silvereyes "tanged" their way from shrub to shrub. I suspect that the latter were part of the Silvereye population that migrates to the Mainland, as at least some of the 'locals' are already breeding. A pair of scolding Brown Thornbills caught my attention, followed by what proved to be the first of several pairs of Yellow-rumped Thornbills. As I haven't yet managed to get decent shots of this species, I decided to attempt to remedy that. I had a little success at first among the fire blackened remains of some large shrubs, at least the leafless bushes didn't give them anywhere much to hide. I had only been photographing here a short while, when a single Shining Bronze-Cuckoo arrived, lifting my spirits considerably. I had heard what I suspect was this bird, calling from several points around the reserve, but decided the steep hillside wasn't the best place to seek this bird out. However, my optimism was short lived, because one of the thornbills had seen it too. With considerable zeal, it went for the cuckoo, with wings and tail spread widely, showing o ff its yellow rump. Exit cuckoo. Back to the thornbills. 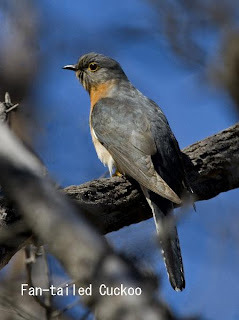 However, the cuckoo hadn't given up that easily, and returned and spent much of the next half hour or so, among the fire blackened shrubs and nearby wattles, and the accompanying images are some of the many I took. My only wish was that there had been some sun! Surprisingly, the yellow-rumps didn't make any attempt to drive it off this time, but they did keep a wary eye on it, often from only a metre or less away. I watched both species find and eat caterpillars, including the very hairy caterpillar in the shot at left. 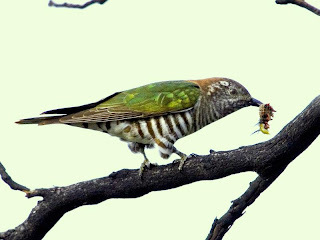 The cuckoo spent several minutes bashing the caterpillar, before devouring it. (It does have a rather 'natty' pair of 'plus fours', something I hadn't noticed before! ).A second cuckoo put in an appearance, dashing back and forth, before alighting and calling from a nearby bush (shot at right). It flew off shortly afterwards. I have found both this species and the similar Horsfield's Bronze-cuckoo, among the more difficult birds to get to grips with, and I felt more than a little excited and privileged to have spent a while both watching and photographing these two individuals. I recorded another 23 'bush' species here, and I might just add it to my list of places to regularly visit.